You can serve these as slurpy little mouthfuls in mini scallop shells or Chinese spoons, or present them as a starter as I have in the photo. 1 Quarter tomatoes, discarding cores, and flick out seeds. Dice flesh finely then transfer to a sieve and drain for 15 minutes. 2 In a bowl put red onion, chilli, coriander, lime juice, salt and avocado or olive oil. Halve avocado, remove stone and peel. Cut avocado flesh into tiny dice. Add to bowl along with drained tomatoes. Gently toss guacamole mixture, then spoon a little of it on to small scallop shells or tiny dishes. 3 Trim any blackish bits from scallops, rinse and pat dry. Toss in a bowl with olive oil. Heat a large non-stick ridged grill pan or frying pan over a medium-high heat and when it is nice and hot, just giving off a slight haze, swish the scallops in the oil in the bowl, then add them to the pan one by one (don’t dump them in one on top of the other). Leave them where they land, don’t move them around, so they can get a rich golden brown and form a sticky coating. Cook for about a minute a side, depending on their size (the pan needs to be hot!). 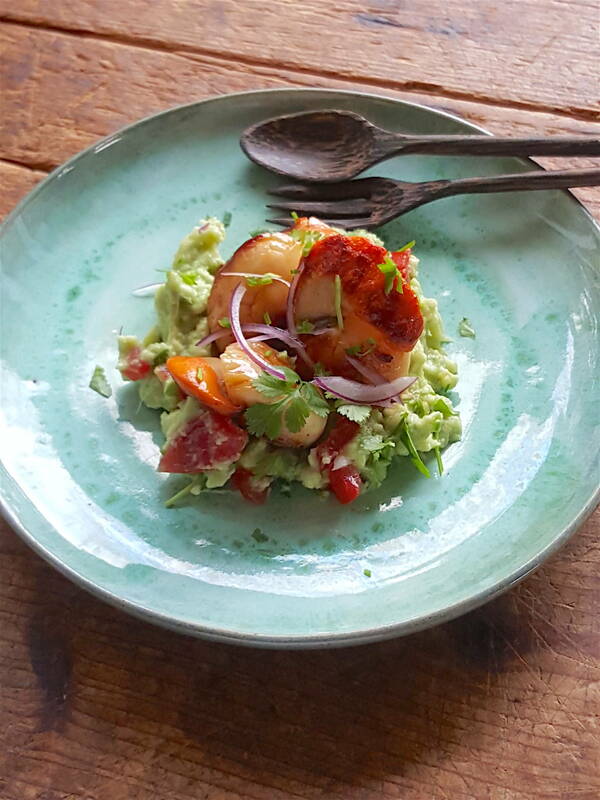 4 Top each dish of guacamole with a hot plump scallop and devour! Alternatively … do it this way (as in the picture). Mash avocado with lime juice and salt. Gently mix through red onion, chilli and coriander. You won’t need the extra virgin olive or avocado oil. Pile onto plates and top with hot scallops. Garnish with a little coriander and red onion and serve. Easy. Tasty. Go wth anything ... skinny peppers with chorizo, cherry tomatoes basil & lemon.